Ranking your business in Google can seem overwhelming, especially if you’re just starting out. Often, the place I’ll start with a new client is to simply Google the keyword phrase they’d like to get found for and see what opportunities there are. Let’s use an example to show you what I mean. I have a friend who’s a general contractor in Longview, Washington. He specializes in kitchen and bathroom remodeling and is interested in putting up a website and marketing his services online. So, I Googled that phrase (on 11-1-14), to see where we should start marketing his business. Okay, lots of information here. Let me break it down into what I see. Lots of advertisers – All the Pay-per-click ads tell me this is a highly lucrative term. That’s a good sign that it’s a great term to rank for organically. Internet business directories rank first – Angie’s List and BBB top the list, followed by homeadvisor.com, houzz.com, dexknows, and others. 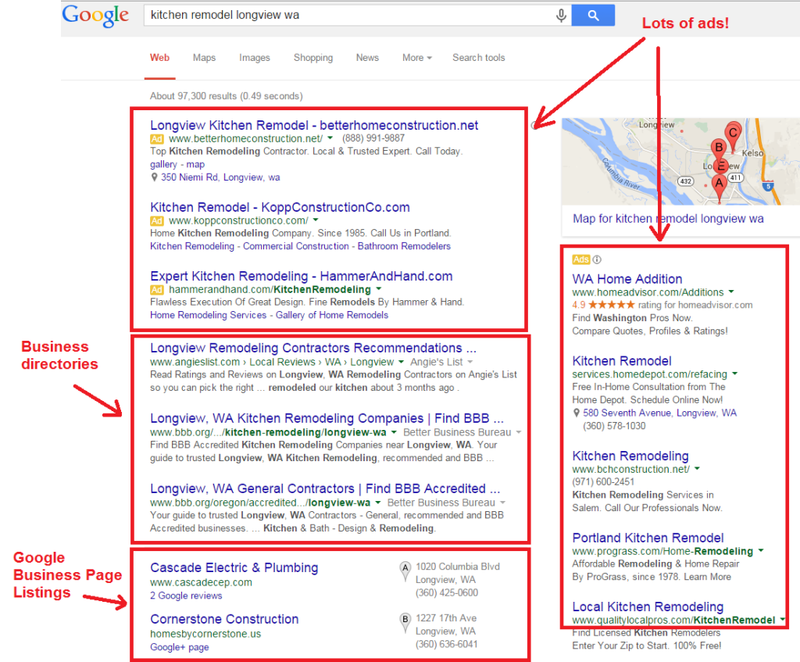 These directories dominate the page one organic search results. Google Business pages are only listing of actual businesses – If you didn’t want to re-search a business directory like Angie’s List, the only listing of actual companies are the local Google Business page listings. So, armed with the information above, here’s what I would do, in order of priority. Claim and Optimize Google Business Page. At the time of my search on November 1, 2014, there are only 5 local listings (denoted by A, B, C, D, E). Google will show up to 7 local listings if it feels they are relevant, so I’d hope to crack this list by claiming my friend’s Google Business page and optimizing it. This is included as part of our Local SEO services. Get Reviews. The 5 businesses I see don’t have many reviews. The #1 guy (Cascade Electric & Plumbing) only has two. Reviews help you rank better and when you get 10 reviews, you get gold stars under your name (which helps you stand out). So, I’d put a review system in place and kick start it by instructing my friend to personally email people he’s done work for and ask them to post a review on his Google Business page. I’d give precise instructions on where they can post the review. Submit To Business Directories. Starting with the top ranked Angie’s List, I would submit my friend’s business information to each directory listed. This does two things (1) If someone clicks on Angie’s List and searches it, you have a chance of being found, and (2) most directories provide a link back to your website, which is very helpful in establishing your site as an authority compared to your competitors. And of course, I’d make sure he had a great looking, well-optimized website because chances are, the other contractor websites aren’t that strong. With any kind of luck, we could get his website to move onto page one. I hope you can see that one Google search can uncover multiple internet marketing opportunities for your business. Imagine the opportunities when you start thinking about other relevant keyword searches! You can probably also see that to take advantage of them and do them well, it’s going to involve a lot of work. This is where we come in. We offer local businesses a complete turnkey internet marketing solution and we also offer customized local SEO packages to help you rank better in Google. Do it yourself by following the advice in our guide, or call me at 503-890-6663 and we’ll work out an internet marketing program that fits your needs and budget.